The All-Pro Teacher program recognizes exceptional teachers who do great things for their students, school and community. The program names 10 teachers each year to receive community recognition. The program also offers financial contributions to the school the teacher works at. The cross promotions began on social media accounts from both ends. 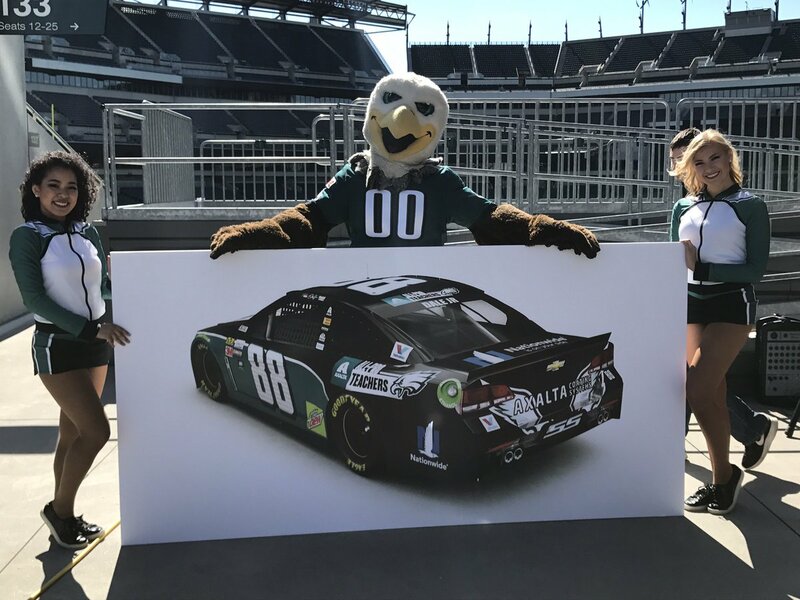 Hendrick Motorsports and the Philadelphia Eagles began announcing the new paint scheme that would be driven by Dale Earnhardt Jr on June 11, 2017 at Pocono Raceway. In early June, just over a week before the race, the NFL stepped in a put a stop to it. The NFL basically told the Eagles that any NFL logos and/or NFL team logos can’t be used in any conjunction of promotion with another sport. Essentially, the NFL didn’t want to see NFL logos at a NASCAR race. “While we are disappointed that we will not have the opportunity to increase the visibility of the Axalta All-Pro Teachers program through the Pocono 400 this year, we remain committed to supporting STEM curriculum and the educators who inspire our youth through our relationship with Axalta,” the NFL team statement from 2017 concluded. A year has since passed and the Philidelphia Eagles have since been crowned the 2018 Super Bowl Champions. The car has been reborn with a new driver as it was announced earlier this month on July 13th. The #88 All-Pro Teachers wrap will run this weekend in the Gander Outdoors 400. For 2018, the NFL has reconsidered their initial stance on the NASCAR partnership. A similar paint scheme with the same promotion will be on the track this weekend at Pocono Raceway. Dale Earnhardt Jr, an avid Washington Redskins fan has since retired from his full-time NASCAR Cup Series career. 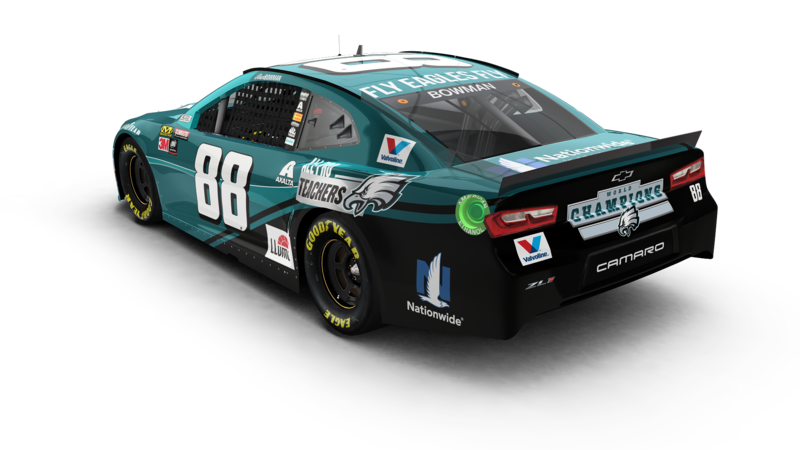 The #88 Philadelphia Eagles NASCAR race car will be driven by Alex Bowman and fielded by Hendrick Motorsports for this weekends event. “The exposure that the Axalta All-Pro Teachers program will receive thanks to Alex Bowman’s No. 88 Chevrolet Camaro ZL1 will showcase the campaign to a national audience,” said Charlie Shaver, Axalta chairman and CEO. “We thank the Philadelphia Eagles, Alex Bowman and Hendrick Motorsports for their dedicated support of such a worthwhile program,” Shaver concluded on behalf of Axalta. Alex Bowman commented on the paint scheme and the new partnership as well. “I’m really looking forward to that,” Bowman said. 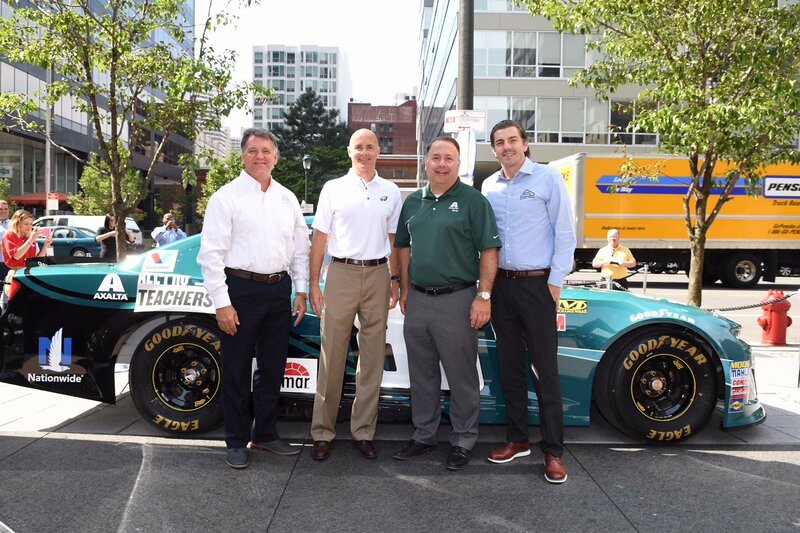 Earlier in May, the Philadelphia Eagles were involved in another small NASCAR partnership. The Eagles Autism Challenge logo was seen on the MENCS ride fielded by Richard Childress Racing and piloted by Austin Dillon. It was a logo seen just ahead of the left rear wheel well. Props to the NFL for coming to their senses and allowing this good cause to take place.